Even though the monitors are mismatched, I’m still quite pleased with the result. Next stop, wireless printing! I’ve seen these Amber Alerts before, but I had a really unusual experience tonight. 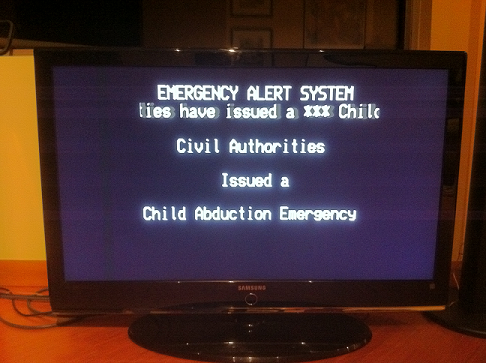 The alert interrupted a recording on my TiVo! I was confused at first, thinking the DVR had recorded the alert earlier in the evening, but I couldn’t pause it or fast forward past it. It was just… there. I had no idea that they had that kind of (a) ability, or, more interestingly, (b) authority to hack into my viewing. Can’t say I’m opposed, though. This information is more important than “Hawaii 5-0”. What I am opposed to is the super creepy announcer voice. You know, if I was at home alone and had the lights down, that announcement would have given me a serious case of the willies. It’s like I’m listening to the kidnapper brag about his crime. I don’t know if that’s the result of some intensive psychological research, looking for the kind of voice that will undeniably grab your attention… or it was just the best recording quality they could afford. But I’ll tell you, it’s frickin’ hard to ignore. I haven’t gotten a new computer for about six (or seven?) years. Today I plunked down five bills and got a new Gateway with an Intel 3 Core, 4 gigs of RAM, and a terabyte of hard drive. (That made me laugh.) I’ve just barely started using it, but I’m hoping some of the more intensive stuff (like streaming video or The Sims 3) will work a little better on this one. The old PC (a Hewlett Packard) wasn’t quite dead yet, but I wasn’t looking forward to reripping eleven thousand CDs of music when it gave up the ghost. Here’s hoping the data transfer process goes smoothly! 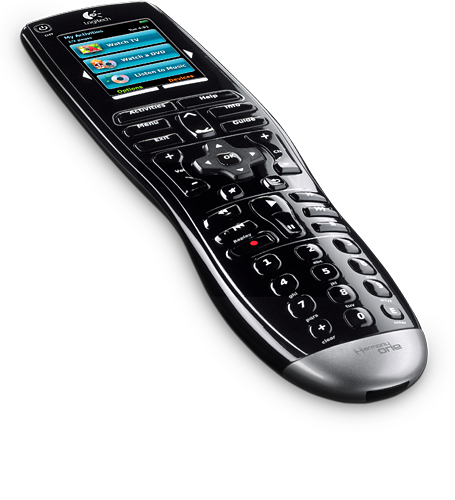 For years I’ve used those $19.99 universal remotes you can get at Bed Bath and Beyond. They’re pretty much okay, but I can never quite get all the functions to work, so I end up with just as many remotes cluttering my already cluttered coffee table. I installed the software on my computer and entered my info for my TV, TiVo, tuner and PS3. At first, the configuration tool didn’t understand which TiVo I had. It asked me to start pressing buttons on the original TiVo remote. That worried me, because I didn’t want to be pressing every frickin’ button on the remote for the rest of the evening. But what was great was after three button presses, it knew enough, and was ready to go. 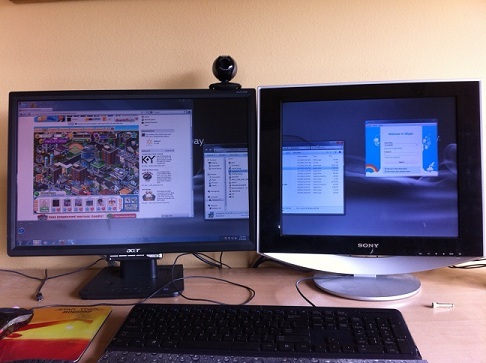 Now I have four “Activities” programmed into the thing: Watch TV, Play Game, Watch DVD and Listen to Radio. With the press of a button, all the devices go where they need to go and I’m good. And if any “Activity” choice doesn’t quite work (e.g. the tuner didn’t hear the command to turn on) I can just hit the “Help” button, and it fixes everything. Still not sure how good the rechargeable battery is, and I’ll have to get used to a new remote structure, but so far, this is a big win.